Ganesh Chaturthi is a most favourite and popular festival of the Hindu religion which will be celebrated all over the country with full devotion and joy. It is celebrated as a birth anniversary of the Lord Ganesha. Ganesha is a son of Mata Parvati and God Shiva. Lord Ganesha is a most favourite God of everyone especially children. He is the God of wisdom and prosperity so people in Hindu religion worship him to get the same. 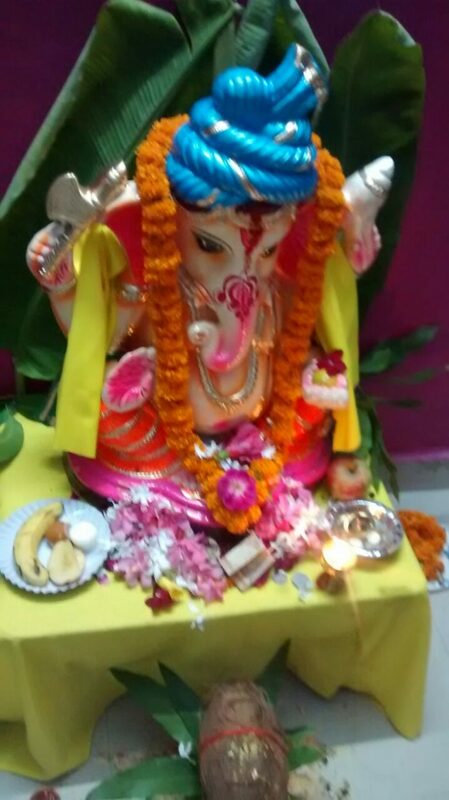 People bring a clay statue of the Ganesha and keep in home on Chaturthi and do worship for 10 days and perform Ganesh Visarjan on 11 day means on Anant Chaturdashi. We have also brought Lord Ganesha in our Digital society and starts to celebrate his birthday with full of devotion, worship and pooja. It gives us an opportunity to get together under one roof and do lord Ganesha aarti followed by Prasad. Children along with all families enjoys the music of Bappa’s aarti in different languages . We played arties in different languagues like hindi, gujarati, Marathi which includes sukhkarta dukhharta, Jai ganesha jai ganesha, Deva shri ganesha, Sabse pyaara dev hamara etc. and keep LADDOS , MODAK, PUNCHAMRIT , FRUITS as a Prasad. These 10 days gives a nice ambiance, peace , togetherness and we really enjoys. On 15th September we will do visarjan of bappa in our holly river GANGA – at Allahabad with a wish “GANPATI BAPPA MORIYA , PURCHYA VARSHI AUKARIYA “. May Lord Ganesha fulfill all our wishes and keep us safe.